It’s never to early, or too late to introduce Yoga and Dance into your life! Here, at The Studio, we offer Private and Group Lessons in many varieties of Yoga and Ballroom and Latin Dance. Whatever your goal, I am here to help you achieve it! I offer Private Dance and Yoga lessons, as well as Group Yoga classes, covering Beginner, Gentle, Restorative/ Yin, Flow Classes and a Mommy & Me Barre/ Yoga Class. 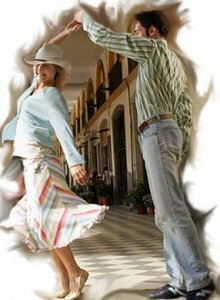 I also offer Group Dance Classes in both Ballroom (Waltz, Foxtrot and Tango) and Latin (Rumba, Cha Cha, Salsa, and Swing) both to Teens who are preparing for Prom or their Quinceañera, and for Adults/ Wedding Couples of all levels. I am also available to teach the more ‘informal’ dances: Two Step, Bachata, Rock and Roll and Merengue. I Choreograph Wedding and Quinceañera Dances as well as Dance Performances for any special occasion. I am also available for professional dance performances and to teach personalized dance classes at your events and parties! The Studio I teach at is located in EADO, near downtown Houston, at the corner of Leeland St and Collier St. In Private dance and yoga lessons you can expect to have the studio all to yourself which means no distractions or sharing of music! Great for beginner and advanced students alike, this allows even the most self-conscious student to feel comfortable, calm and/or adventurous! It’s an amazing paragraph designed for all the internet people; they will obtain benefit from it I am sure. Hi Nicole. For some reason I can’t connect through thumbtack. I want to reschedule our lesson for bachata lessons with my wife next week. Tuesday or Wednesday evening? Jim! I didn’t ever see this, I’m so sorry! I’m sure you moved on to lessons with someone else and I hope you’ve had a wonderful time dancing!